A high-performance, low-cost sensor that offers the highest resolution, accuracy, and stiffness available to provide a sense of touch to your application. All of the electronics are built into the transducer body, which keeps the cost down and the footprint smaller. Like all of ATI's F/T products, the Axia80 features superior quality and robustness. Available with Ethernet, EtherCAT, and Serial communication. Extremely-High Strength: Precision-machined from high-strength aircraft aluminum. 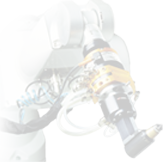 Maximum allowable single-axis overload values of 5.0 to 12.5 times rated capacities. High Signal-to-Noise Ratio: Strain gages provide exceptional resolution and accuracies better than 2% full scale across all axes and calibrations. IP64 Protection from dust and splashing water. *The resolution is typical for most applications and can be improved with filtering. **Resolutions quoted are the effective resolution accounting for noise. ***Applied loads must be within range in each of the six axes for the F/T sensor to measure correctly. applicable ATI procedures. These procedures are compliant with the ISO 9001 standard to ensure that products are within ATI specifications. Contact your sales representative for accuracy information.